David Goodwillie. 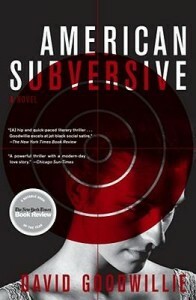 American Subversive. New York: Scribner, 2011. Aidan Cole is only thirty-three, but his privileged existence in New York City has become an embittered one. Roorback (a word meaning a false or slanderous story used for political advantage) is the digital baby that has brought so much heaviness to his once idealistic life. A blog devoted to gossip and news, all served up with a healthy amount of disdainful sarcasm, Roorback was invented and is maintained by Aidan to great success, but it has now taken up so much room in his world that he has nowhere to go but deeper into his own malaise and disinterest. Even a mysterious explosion above world-famous Barneys quickly fades into the background of his routine. Outside of Roorback, Aidan’s life is a mixture of hip parties and expensive dinners with his fashionable Times columnist girlfriend Cressida. Then, someone sends him a brief but electrifying email: a photograph of a young woman walking away from the smoking explosion over Barneys, accompanied by a single sentence: This is Paige Roderick. She’s the one responsible. Spurred into action, Aidan sets out to find the mysterious Paige Roderick…and stumbles into a world of secrets, eco-warriors, and fanatics. Set partially in North Carolina, American Subversive is a gripping portrait of a generation whose greatest enemy is its own boredom. Through the eyes of two very different but strikingly similar individuals, Goodwillie’s tale chronicles their efforts to develop meaningful voices and find anything in which to believe in a disinterested, mortally hip world. Phil Bowie. 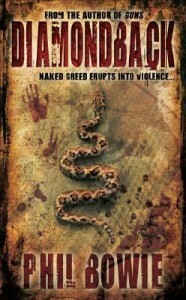 Diamondback. Aurora, IL: Medallion Press, 2007. When the Cherokee were exiled from their mountains in 1838, their secrets and lore went with them, including how to find their precious gold mines. The new inhabitants of the Smoky Mountains have been searching ever since for these riches, finding some, but untold wealth still lies hidden in the North Carolina hills for those who know where to look. Moses Kyle isn’t the smartest of men, but he knows the backcountry of Haywood County, and one day he finds the ultimate motherload: a secret cave full of quartz and gold. But when the wrong people find out about his secret knowledge, they will do anything to extract the location. The local Cagle clan are many things, but patient isn’t one of them. Determined to souse out riches, they use their familial connections to a Pentecostal preacher (and his collection of snakes) to interrogate Moses. Meanwhile, life has been difficult for John Hardin (formerly Sam Bass). Barely surviving the explosion that killed his girlfriend Valerie on the Outer Banks, he’s had to transition to a life in the Smokies. Even though the threat that placed him under witness protection is nearly gone, John is still living under the radar. When Moses Kyle goes missing and then turns up dead, John’s adopted mother, Hattie, begins to worry. She won’t rest until John looks into the situation, and once John goes looking, he finds more than he anticipated. Although he would like to keep living a quiet life with his successful aerial photography business, John can’t let these stones stay unturned. Along with his neighbor, the attractive, motorcycle-riding Kitty Birdsong, John investigates Moses’s mysterious death. Kathryn Magendie. Sweetie. Memphis, TN: Bell Bridge Books, 2010. Best friends have a way of teaching each other lessons. Melissa’s life changed the day she met Sweetie, a unique and independent girl with “mountain spirit.” Over the course of a summer, Sweetie expands Melissa’s world beyond television and candy bars to the hills and Native American traditions of Haywood County, North Carolina. She helps Melissa slim down, control her stuttering, and develop more of a backbone. Sweetie’s reputation around town, however, is that she is a strange girl with a questionable background. Her inability to feel pain is deemed especially odd; classmates make fun of her. Melissa also becomes the brunt of their bullying because of her friendship with Sweetie, but she is proud of her best friend. When Sweetie needs assistance saving her dying mother, Melissa steps in to guard her from the town gossips. But Melissa cannot protect Sweetie, and Sweetie disappears without a trace. Despite her confidant’s absence, Melissa will be forever aware of the magic of friendship. Wayne Caldwell. Requiem by Fire. New York: Random House, 2010. The Blue Ridge Parkway, “America’s Favorite Drive,” celebrates its 75th anniversary this year. The National Parkway was established as a New Deal program to create jobs and to promote tourism in a region that was foreign to many Americans. Today, the picturesque landscape and enlightening roadside markers provide visitors with a glimpse of the beauty and culture of Appalachia. Although the picture of the Parkway is pleasing today, its design and formation created tension and pain in the mountain communities it winds through. As Wayne Caldwell shows in Requiem by Fire, families were stripped of their homes, livelihoods, and even relationships with one another. When the North Carolina Park Commission comes to Cataloochee to discuss buyouts, community members learn they have two unhappy options. They can sell their farms now at a loss and leave, or sell at an even greater loss but continue to lease the land from the government. With regulations such as what natural resources they can harvest and even what burial techniques they can use, many people feel compelled to leave and try to start anew. However, other families decide to stay at they only homes they have ever known. This is difficult, though, because their villages shrink and social networks dwindle. No matter the choice made by the natives of Cataloochee in the late 1920s, “home” is forever changed. Highlighting the strong connection to place felt by the people affected by the Blue Ridge Parkway, Caldwell provides a different view of the beloved roadway. Kerry Madden. Jessie’s Mountain. New York: Viking, 2008. This is the third and final installment of the Maggie Valley trilogy, and many of the Weems family members are facing difficult decisions. Livy Two is still hoping to break into the Nashville music scene. She’s encouraged to reach for her dreams when Grandma Horace gives her Mama’s childhood diary, filled with dreams she never had a chance to follow. The sisters are inspired by the entries in their mother’s diary, and sections of the diary are included throughout the book. While Mama currently struggles with the family’s financial problems and debates moving the family away from their valley home, Livy Two and her younger sister Jitters set out for Nashville and the biggest adventure of their lives. After returning to Maggie Valley the girls, still filled with entrepreneurial spirit, find a way to honor their hardworking Mama and solve the family’s financial problems. Kerry Madden. Louisana’s Song. New York: Viking, 2007. In this sequel to Gentle’s Holler, Livy Two’s sister Louise is having a hard time going to school – she’s shy and would rather stay home and work on her art. Daddy is finally back at home after the accident, but the family’s financial problems are getting worse. The Weems children help out as they know how – Emmett still works for the carnival, Livy Two helps out with the bookmobile, Becksie waitresses at the nearby pancake house, and Louise begins to sell portraits. Through their endeavors to help the family, Livy Two and Louise begin to come into their own. The confidence Louise gains from selling her art helps her to stand up to the bullies at school in her own special way. Livy Two is also empowered by working and begins to send her songs to the music men in Nashville. However, when Daddy goes missing, will their confidence be shaken? Kerry Madden. Gentle’s Holler. New York: Viking, 2005. When she’s not babysitting her younger siblings and helping out with household chores, twelve-year-old Livy Two Weems has a wild imagination and wanderlust about seeing the world outside of her mountain valley, largely inspired by the books she borrows from the mobile library. She’s also creative, and takes after her father, a struggling song writer and banjo player. The song lyrics and guitar riffs Livy Two writes about her life and family relationships are interspersed throughout the chapters. Livy Two’s youngest sister is just a toddler, but Gentle was born blind and needs extra help. The emotional ties between the sisters are explored throughout the book. After Gentle is lost for a few hours in the valley, the tie between Livy Two and Gentle is cemented when Mama ties the two girls together with an apron to prevent Gentle from getting lost again. Through all this, Livy Two keeps her chin up, but when a terrible accident happens to her father, she isn’t sure if she can be strong enough to help her family through these trying times. Kerry Madden. The Maggie Valley Trilogy. Gentle’s Holler. New York: Viking, 2005. Louisiana’s Song. New York: Viking, 2007. Jessie’s Mountain. New York: Viking, 2008. Set in the mountains of North Carolina during the early 1960s, the books in the Maggie Valley trilogy follow the Weems family as they go through life in a small valley town in Haywood County. Jessie and Tom Weems have ten children, with unique talents and personalities. The books are narrated by Livy Two, their second oldest daughter who is twelve years old and full of moxie. Livy Two writes her own songs, plays the guitar, and generally takes after her father. Mountain music and song lyrics are included in many of the chapters, creatively explaining how Livy Two sees the relationships between family members and describing their way of life. The Weems family is also joined by the cantankerous Grandma Horace and an affable pet dog, Uncle Hazard. While nothing ever seems to be easy for the Weems family, their ties stay strong as they experience financial problems, health problems, and a major accident. The novels explore the relationships among all the Weems children, but pay particular attention to three of the Weems daughters – Livy Two, Louise, and Jitters – as they come into their own. Ron Rash. Serena. New York: Ecco, 2008. Set in 1929, Serena begins with timber-baron George Pemberton bringing his new wife from Boston to the North Carolina Mountains. The wife is the titular Serena, an ambitious and intelligent woman who is a good match for her husband and who quickly settles into life in the lumber camp. But as many of her material desires are met, she also faces dissatisfactions due to uncertain investors, the presence of Pemberton’s illegitimate child, and the U.S. government’s attempts to buy land to form Great Smoky Mountain National Park. Her ambitions and cruelty grow. In addition to portraying Serena as a Lady MacBeth-like character, author Ron Rash also presents a look at early environmentalism and shows the harsh and dangerous world of timber labor during the Great Depression. Serena was listed as one of the best books of 2008 by The New York Times, Amazon.com and Publishers Weekly.